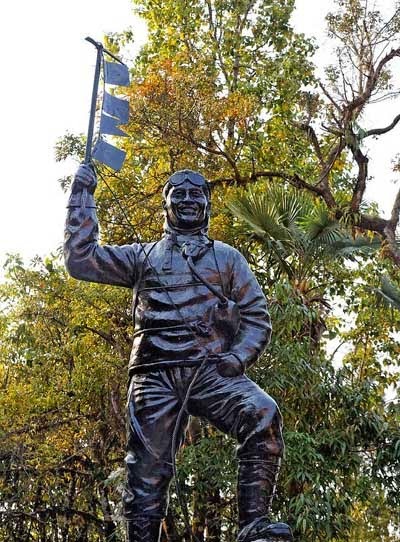 The Himalayan Mountaineering Institute (HMI) in Darjeeling has decided against shifting the statue of mountaineering legend Tenzing Norgay Sherpa from its existing location after a prolonged discussion with members of the Sherpa community on Sunday. To commemorate the achievement of being the first to summit Mount Everest on May 29, 1953, the HMI had installed the statue. Tenzing Norgay’s friend and partner Sir Edmund Hillary had flown in from New Zealand and unveiled the statue on March 25, 1997 amidst much fanfare. In fact, after summiting Everest in 1953, the HMI was established and Tenzing Norgay was made the field director of training and also remained advisor to the institute till his death on May 9, 1986 in Darjeeling. different Everesters and gears used to climb peaks. After the meeting on Sunday, the institute’s principal Gulshan Chadha said, “It has been decided that we will not shift Tenzing Norgay’s statue from its existing location as wished by the Sherpa community. We must respect the sentiments attached with the legendary mountaineer”. He however asserted that as planned earlier a new three dimensional statue which would be installed soon. “We want a 3D typeof statue of the legend and we will install one for the benefit of the tourist visiting out institute. But, this will take some time now,” added Chadha. The Sherpa community under the banner of Sherpa Buddhist Association (SBA) had vehemently protested against the institute’s move to shift Tenzing Norgay’s statue from its present location. They had held a demonstration in front of the institute and even threatened to close HMI. Following the demonstration on February 16, the institute’s principal who then was out of station in a telephonic communication had called a meeting today to diffuse the situation. unveiled the statue. We are happy that the decision to shift the statue has been taken back and we thank the institute’s principal,” he said.